I’ve been working with Mike Hartshorn and the people at Dotmatics who have incorporated OpenAstexViewer (a 3D molecule viewer) into the application and I’d like to highlight the current results. For this functionality you need to download the latest Vortex build from the Dotmatics support site, the latest version comes with OpenAstex Viewer originally developed by Mike Hartshorn whilst he was at Astex Therapeutics (M.J.Hartshorn, JCAMD, 16, 871 (2002)) and it is now available under a GNU LESSER GENERAL PUBLIC LICENSE. You also need to the following short Vortex script to activate the viewer. # so that they will appear above the OAV plot. # which is useful for looking at structure on another monitor. 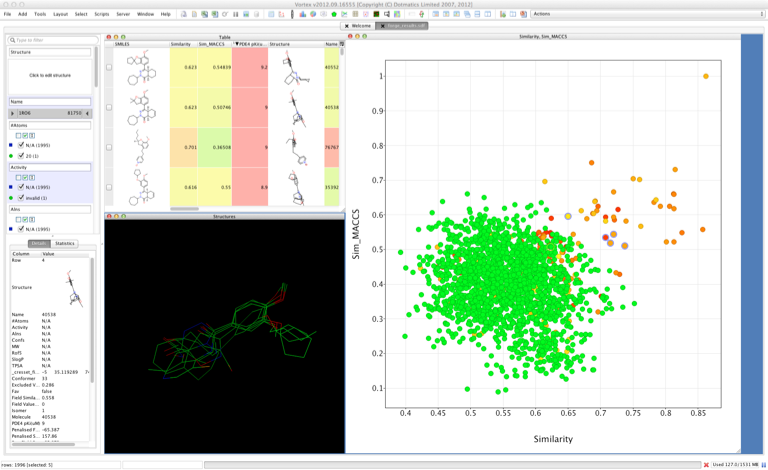 In the previous review we had a view as shown below, in which the plot shows the similarity score from ForgeV10 versus the Maccs similarity calculated using a Vortex script and the points coloured by biologic activity. Whilst this is a useful way of looking at the data, in order to explain why some of the actives are poorly scored by ForgeV10 we need to look at the docking pose. Whilst we can do this by continually switching back and forth between applications this is a far from ideal situation. If you use the script above it inserts an Astex viewer window into the workspace. If you then select a group of points in the scatter plot the corresponding structures are shown overlaid in the Astex Viewer window, the selected points are also automatically selected in the molecular spreadsheet view. 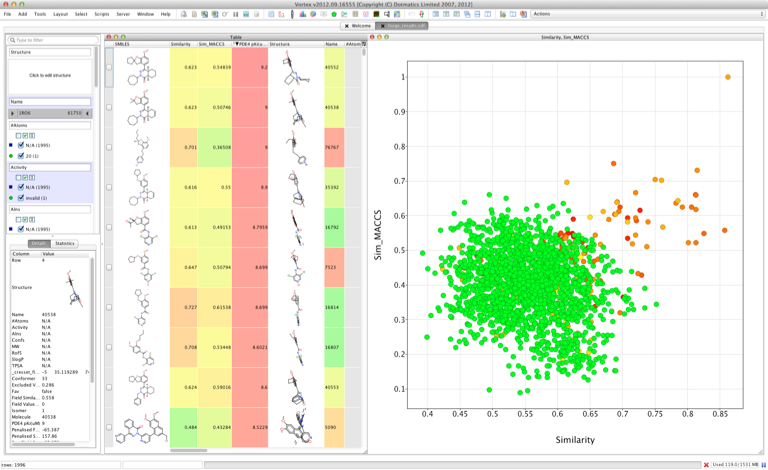 This allows you to rapidly and easily compare structures to identify regions of the ligand molecules that might explain differences in activity. 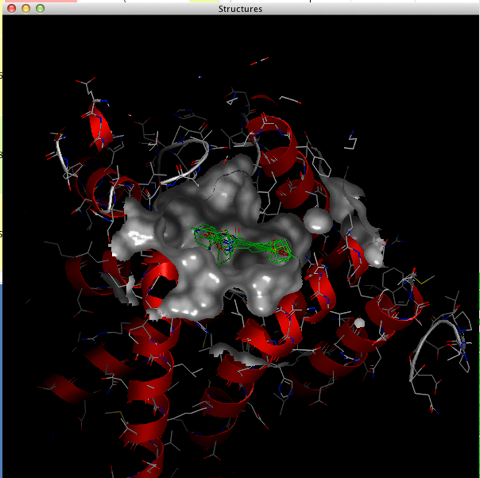 ForgeV10 also uses the protein to provide an excluded volume, this might explain the lack of activity of some molecules to include the protein structure simply right-click on the Astex Viewer plot to bring up a small control panel. 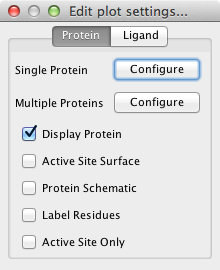 In this case we have a single static protein that was used for all ligands, so simply click the appropriate “Configure” button and select the protein. You can then use the check boxes to configure the display. If you have multiple monitors or are displaying using multiple projectors you can click on the Astex Viewer window and then choose “Detached” from the top right “Actions” menu of the main Vortex window and then the Astex Viewer window can be moved independently of the main Vortex window. This is a wonderful way to explore structure-activity and docking results, it can of course be used with any docking/virtual screening program as long the structural output has the resulting docked structures in the same co-ordinate space. and the Proteins must named correspondingly 1RO6284091.mol2 etc. So now when you choose the appropriate “Configure” button from the Astex Viewer popup control panel, then chose one of the proteins and you will be presented with a text field describing the path to the protein structures e.g. When you select a data point, each complex will substitute the value of its name column into the string and load the corresponding protein structure into Astex Viewer. There are a number of Vortex scripting tutorials here and I’ve started a Vortex scripting exchange here.